Rob and I had been planning on heading up to the Indiana lakefront for the past few days, so when a Barnacle Goose showed up, not too far away in Illinois, we decided to make a day of it. We had high hopes as we arrived at the pond behind the shopping mall that the bird had been using. Unfortunately, the bird was no where to be seen. There were many Canada and Cackling Geese in the area so we checked lots of other areas without any luck. After our unsuccessful and time consuming search we headed to Dunes State Park to look for redpolls. This time we were met with much more success when 15-20 or more dropped into the feeders. 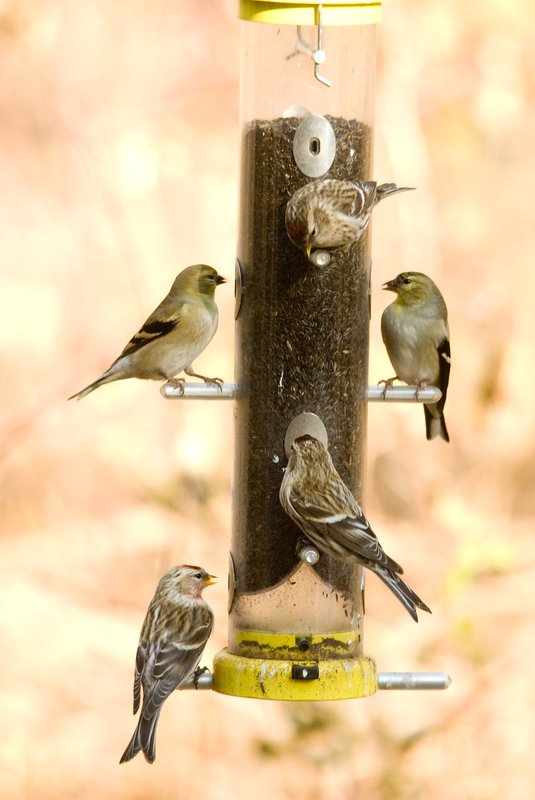 There were also American Goldfinch, Pine Siskins, and Purple Finches mixed in with the other feeder birds. We didn't have a ton of daylight left so we headed to Ogden Dunes to look for our other target species of the trip, Bohemian Waxwing. 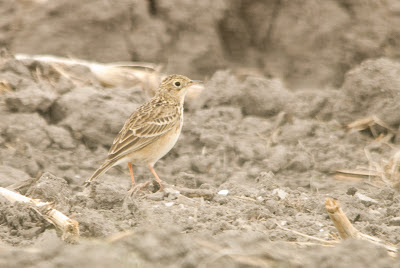 Although we may have heard a couple of very distant Bohemians we had no luck. 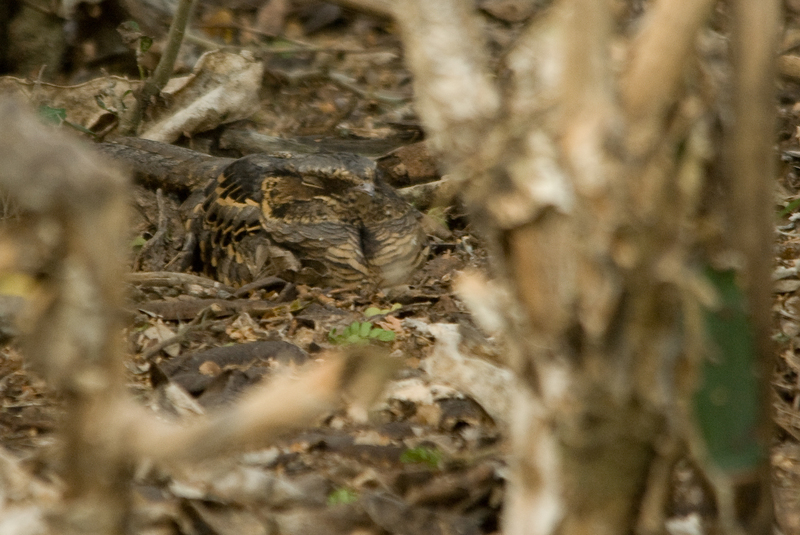 But the biggest surprise of the day turned up, a very late Clay-colored Sparrow. This bird was hanging out with the juncos and was only seen once but we were able to get a few quick photos. During my time in Texas, I spent most of one day birding at Estero Llano Grande State Park. For many birders that visit the valley, this is the highlight of the trip. 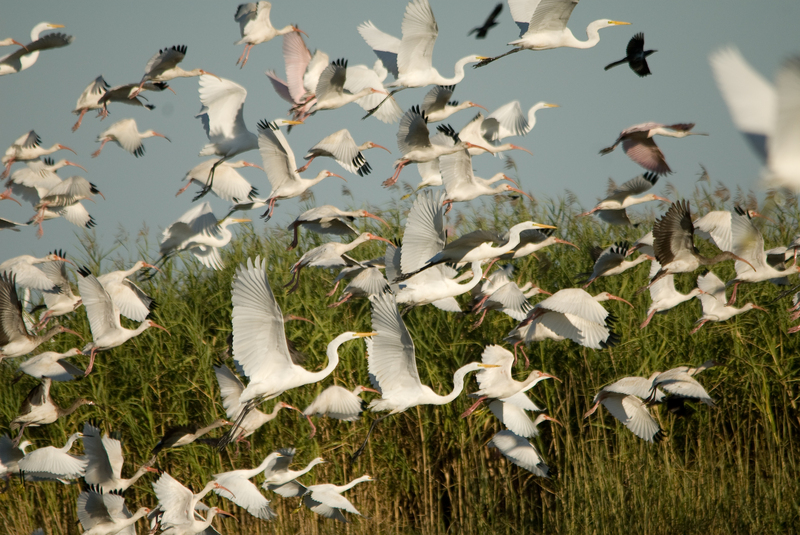 Almost all of the specialties are possible as well as many species of waterbirds due to the extensive lake/marsh habitat. My favorite area of the park is the tropical zone which is a heavily wooded in most areas and usually holds a few uncommon birds. The visitor center (which you have to pay at) is also a nice spot to scan one of the marshes that is usually very good. The tropical zone is an interesting area with a few houses mixed throughout the forest but the habitat is still great and attracts many species. 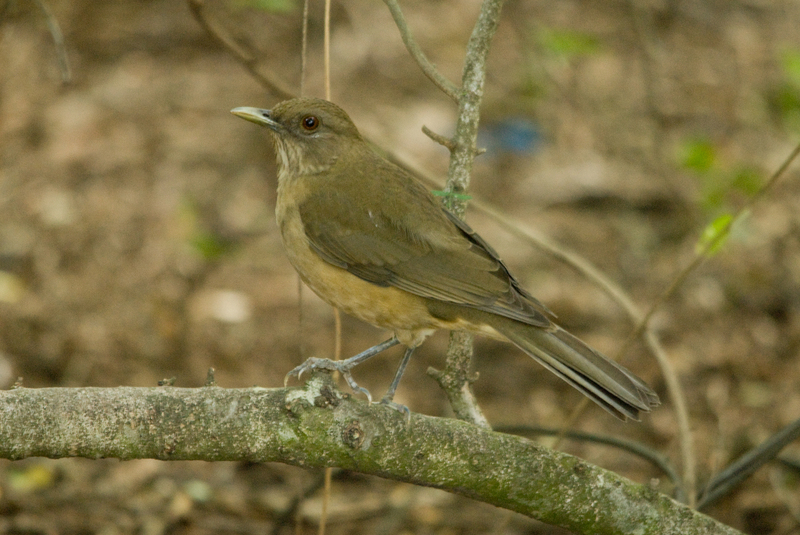 There is a feeding station which attracts most of the common birds in the area and a water drip that usually has a Clay-colored Thrush or Olive Sparrow both of which do not commonly come out into the open. wouldn't be too difficult to find. 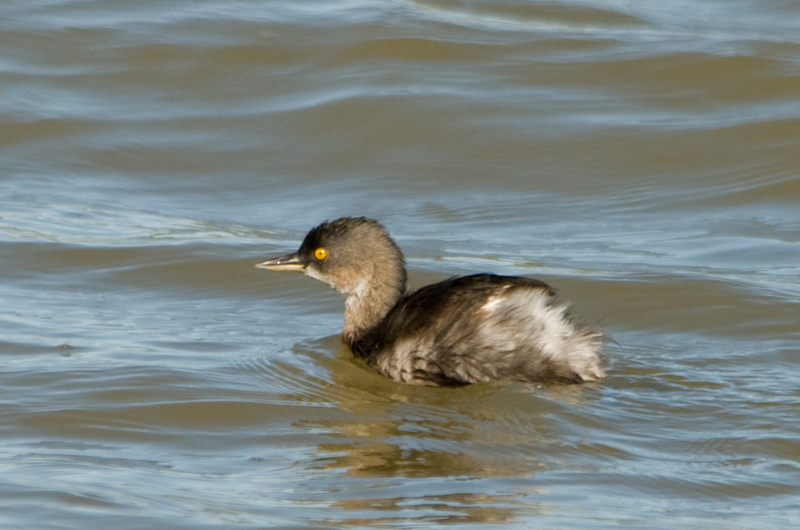 The marshes teem with waterfowl of many species including the extremely cute, Least Grebe. 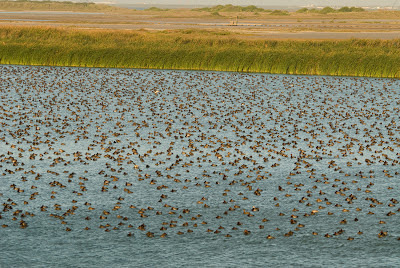 It is also one of the more reliable spots to find Fulvous Whistling-Duck during the winter. 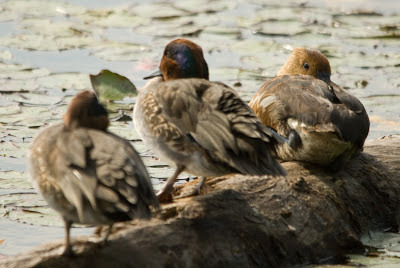 Of course, as with most lakes in the area there are always a good number of Black-bellied Whistling-Ducks. Both Green and Ringed Kingfishers hunt the marshes and canals; during my visit I watched as a Ringed Kingfisher tried to eat a turtle. I eventually left the kingfisher when it seemed like he would never be successful in downing the turtle. Kingbirds usually hunt over the marshes as well with Tropical being the expected species in the late fall/winter. Pretty much, it is a great place to bird, with something new around every corner. This week was a very strong finish to our November bird quiz series with lots of correct answers. We had two people get all of the quizzes correct, Landon Neumann and Nick Kiehl, and the winner is Landon! 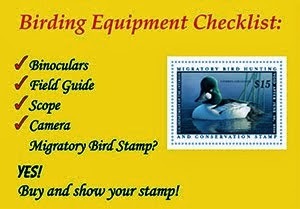 The next quiz will be the first in another series of four quizzes for another NuttyBirder.com t-shirt! 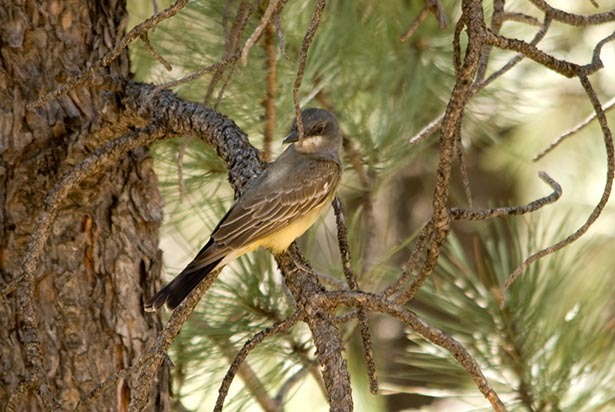 Our bird this week can be fairly easily identified as a kingbird for a few simple reasons. The gray head and chest, yellow belly, long tail and primary projection, and the thick, fairly long bill eliminate all other birds. They gray back and what appears to be a mostly gray chest quickly eliminate Couch’s and Tropical Kingbirds. The long, black tail and the long primary projection with primaries extending beyond the undertail coverts eliminated Couch’s and Tropical Kingbirds as well. So, we are down to Western and Cassin’s Kingbirds which can be difficult to identify in some situations; luckily we can see the field marks that separate these two species. The white-tipped tail (instead of white-edged down the sides in Western) and the distinct white chin of the Cassin’s Kingbird are quite noticeable. Also the dark gray back instead of a greenish back in Western helps to identify this as a Cassin’s. The darker gray chest and head (than Western) as well as the whitish edged wing coverts are just icing on the cake for this identification. 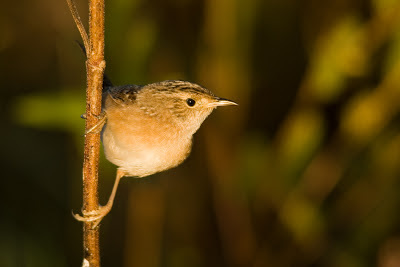 The first quiz in our next series of quizzes can be found at http://nuttybirder.com/BirdQuiz/birdquiz.html. 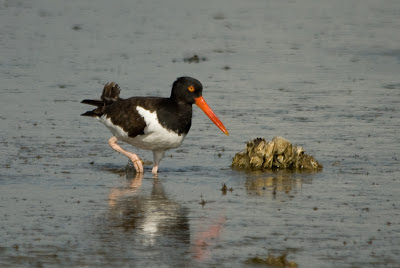 On the northeast coast of Texas, is a remote beach and coastal marsh that is still fairly undeveloped. Driving west from Sabine Pass, Texas on Highway 87 you dead end into the state park and McFadden National Wildlife Refuge with miles of wilderness. The best way to explore this area is by kayak or canoe but even without, most birds are fairly easily found. Northern Harrier above the dunes. Great-tailed Grackle take off from the coastal marsh. Sea Rim State Park provides easy access to a great coastal marsh and dunes as well as a great stretch of the coast. 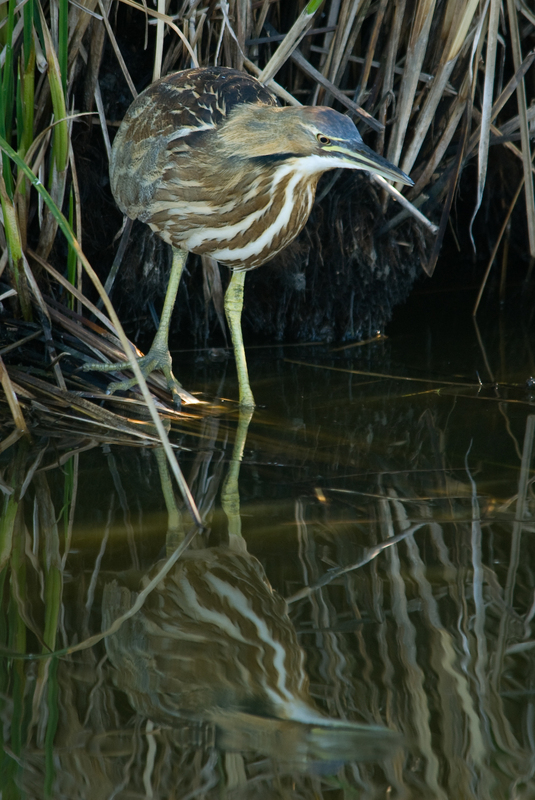 A boardwalk takes you around the marsh where you can get nice views of all the herons and egrets, shorebirds, and ducks. 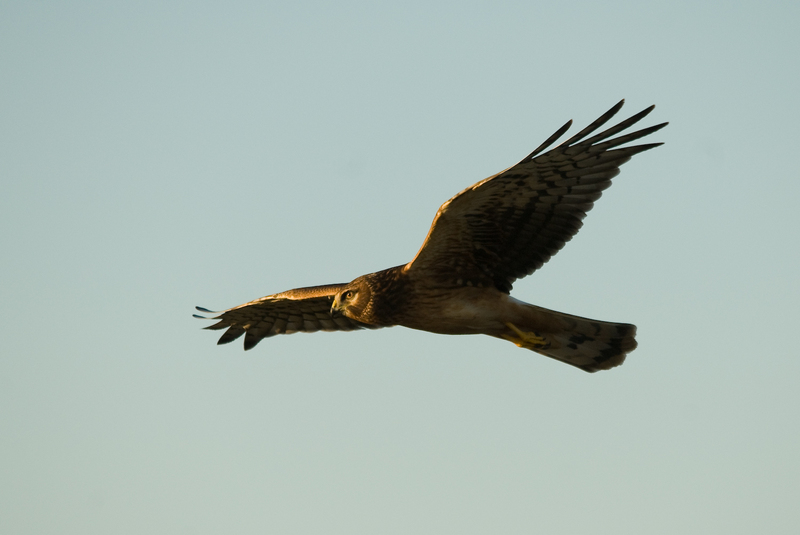 During the winter, Northern Harriers cruise over the marsh to add a bit more excitement and Merlins zip by while hunting the beach and dunes. Seaside Sparrow-one of many wintering in the dune grasses. A walk down the beach and into the dunes is well worth it as well. Many shorebirds gather in the winter including many Snowy and Piping Plovers, Marbled Godwit, and American Avocets. Merlins hunt from perches on the beach while Brown Pelicans dive into the ocean catching fish. 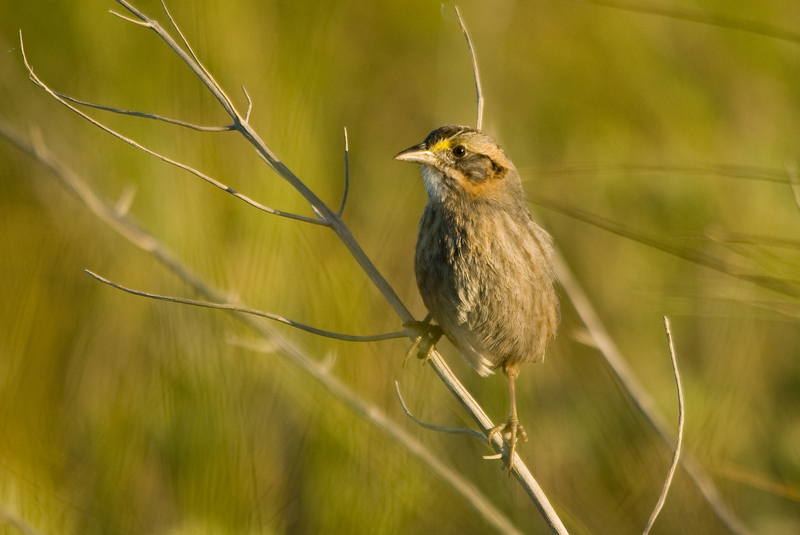 A walk in the dune grasses will quickly provide great views of Seaside Sparrow and Sedge Wrens. 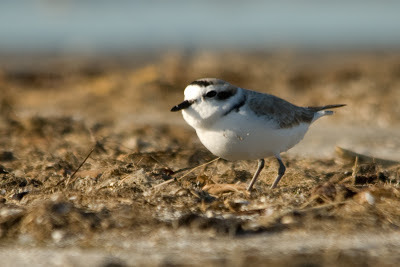 And, when you get sick of the open habitats, you can head back east on Highway 87 to a couple of woodlands, such as Sabine Woods where migrants abound in season. 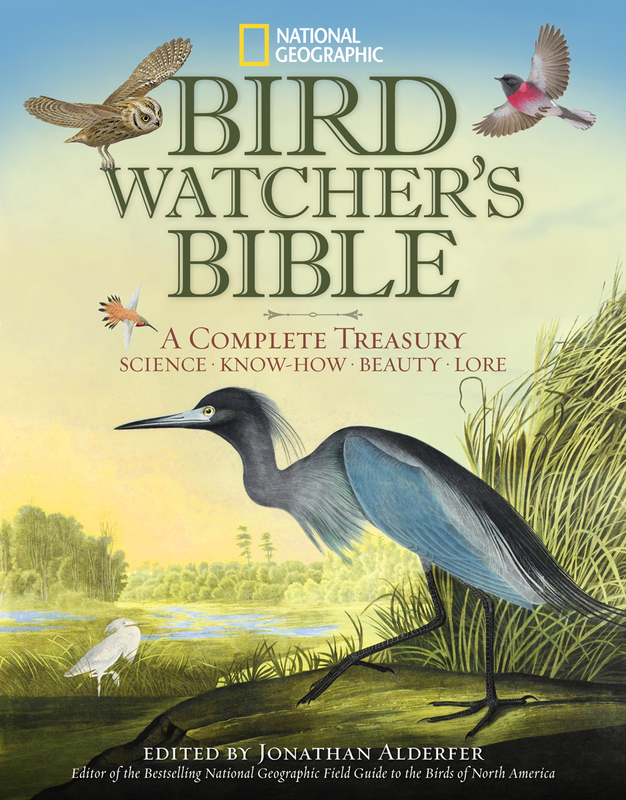 National Geographic Bird-watcher's Bible: A Complete Treasury is packed full of information. 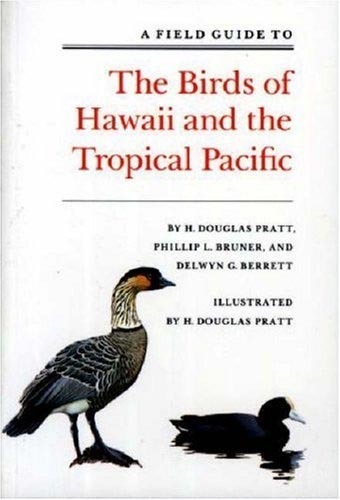 By covering everything from avian anatomy to how to become a birder, there is little information that you cannot find in this book. Over the past several days, I have read parts of all the sections of the book, and it is really quite amazing how much information is included in each area. In addition to the written content, the photography and illustrations are phenomenal. Every page has interesting and informative artwork that really helps drive home the points made in the text. "Like stealth bombers, owls are equipped with deadly tools. The edges of their wing feathers have soft fringes for silent flight, their night-vision eyes are large and forward-facing, their radar-dish heads can swivel through 270 degrees, and their large ear openings are set asymmetrically to give them three-dimensional hearing." While all the authors that contributed to this book are talented, I most preferred the sections written by Scott Weidensaul. His introduction and chapter on Flight and Migration are fantastic. 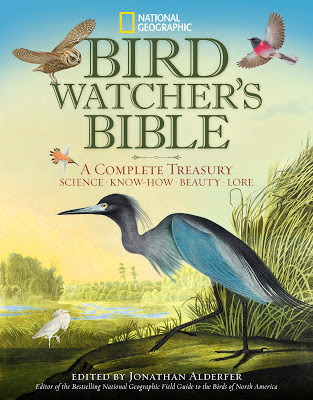 This book is a great addition to any birders collection and would make a very nice Christmas present! 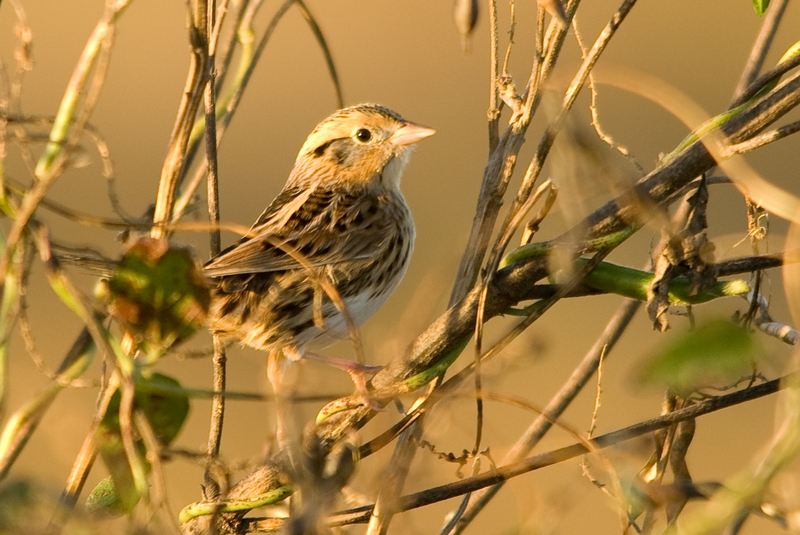 Even though sparrows can be quite tricky, most people were able to figure out our quiz bird this past week. 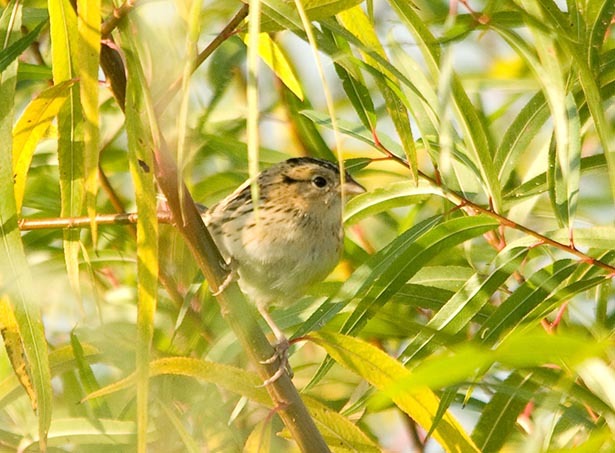 This week we have a bird that is pretty easy to identify as a sparrow right off the bat; just take a look at overall shape, bill shape, and the usual sparrow coloration of brownish tones with some streaking. A few sparrows don’t fit this individual due to heavy streaking (Song, Savannah, Vesper, etc) on the chest. Also, quite a few sparrows don’t fit this individual due to no streaking on the chest (too numerous to mention them all). When we look at the head shape of this individual it quickly identifies this as an ammodramus sparrow. 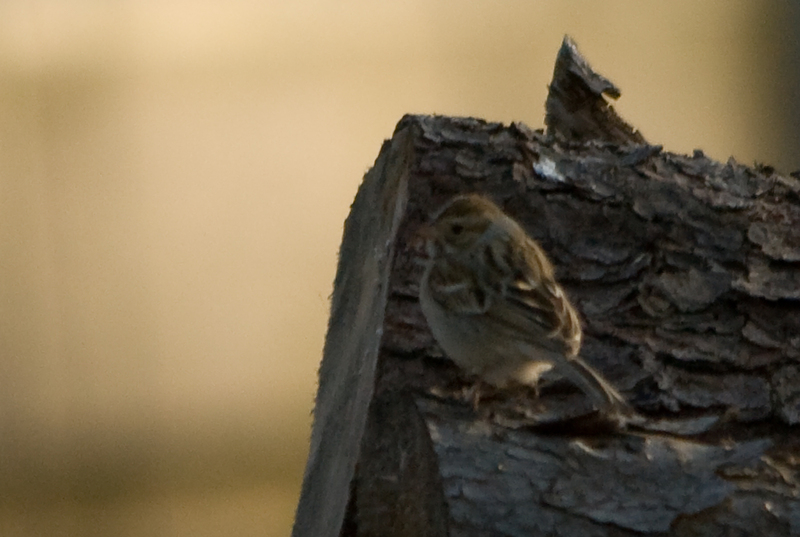 The flat head shape is fairly distinct among the sparrows. The three ammodramus sparrows that have similar chest streaking to this bird are Le Conte’s, Nelson’s, and Henslow’s Sparrow. 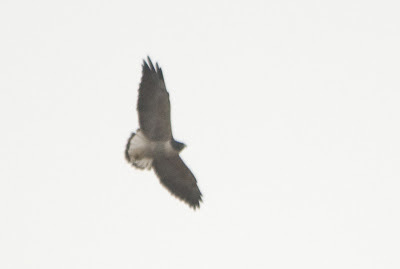 Henslow’s usually shows heavier streaking than this individual and doesn't show the grayish face and streaked nape that our quiz bird shows. Also, Henslow’s has a distinct olive-yellow nape and back half of the eyebrow. Nelson’s is usually much brighter/more colorful overall and doesn't show a median crown stripe or a streaked nape. Nelson’s also has a very distinct plain gray nape. 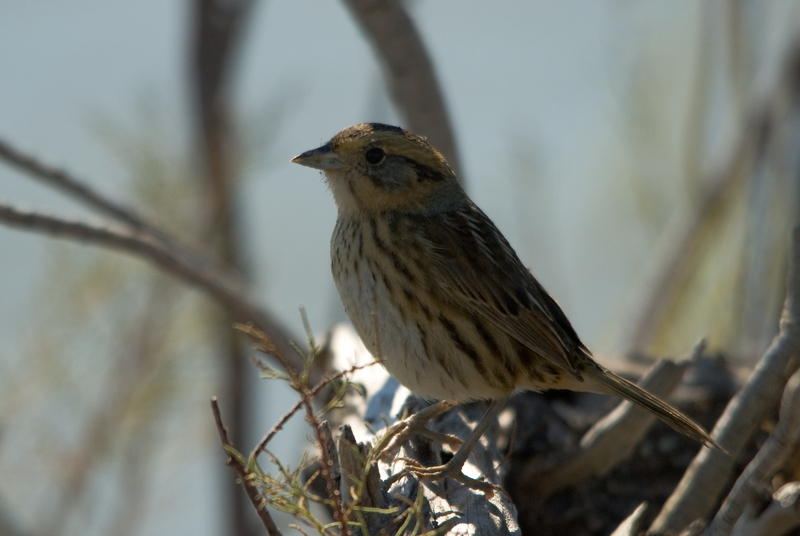 So our bird is a Le Conte’s Sparrow. 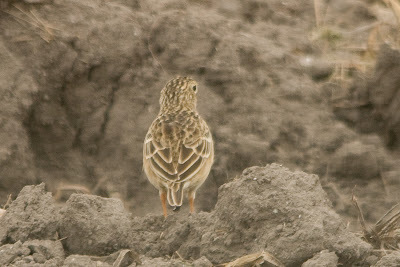 The final quiz in this series can be found at http://nuttybirder.com/BirdQuiz/birdquiz.html#.UKpRXIeoOSo. From Carmel, Indiana, Rob writes: This weekend I was in northern Ohio to help lead a Lake Erie pelagic trip for Black Swamp Bird Observatory (BSBO)! My weekend started out with a meeting with Greg Links and Kenn and Kim Kaufman to start planning the field trips for the 2013 Biggest Week in American Birding (BWIAB). We have some awesome trips in the works, so keep an eye on the BWIAB website for some sneak peeks coming soon. On Saturday, we set off early on the BSBO Bird Bus to head towards Cleveland where we would get on the boat we took into Lake Erie. 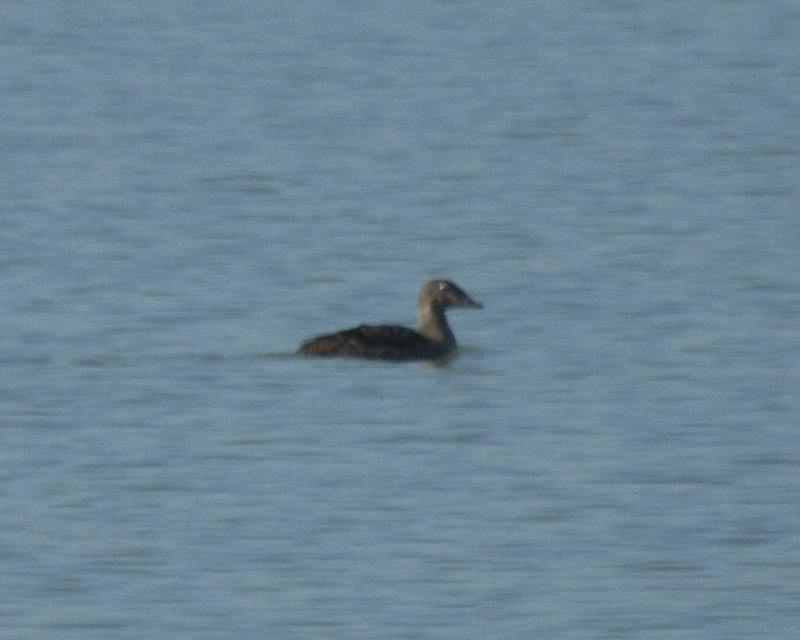 Two days prior, a female King Eider had been found not too far from the harbor, so we decided to head in that direction. 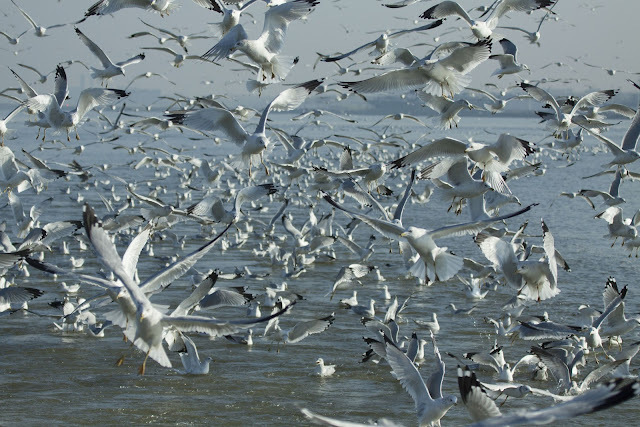 Once we got out of the harbor, we also started chumming for gulls with bread and popcorn. It immediately attracted a huge following of Ring-billed Gulls! 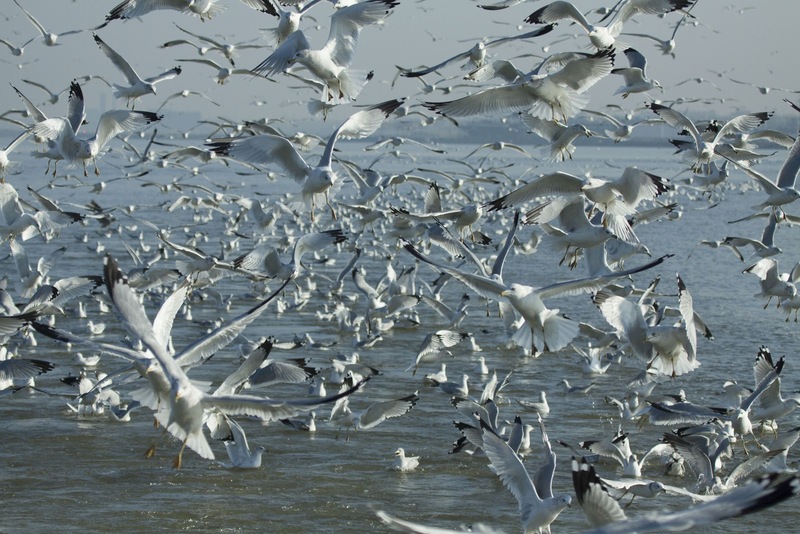 Hundreds of Ring-billed Gulls behind our boat! As we moved closer to the area where the eider had been hanging out, we found two White-winged Scoters with one Surf Scoter. 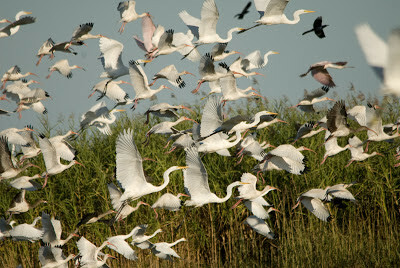 These birds were lifers for several people on board! Just after seeing the scoters, we thought we had spotted the King Eider, but as we got closer we realized we had picked out a different bird. Almost immediately, someone spotted the eider and we slowly moved the boat into position. This was a life bird for me, and it was really amazing to see how distinctive the head shape of an eider is! Amazingly, we still had about 2.5 hours left to explore the lake after everyone got their fill of the eider. We moved farther out into the lake towards an area called the "Crib" with our entourage of gulls in tow! The Crib is the main water intake for the Cleveland water supply. It is a huge structure that sits about 3 miles out in the lake. 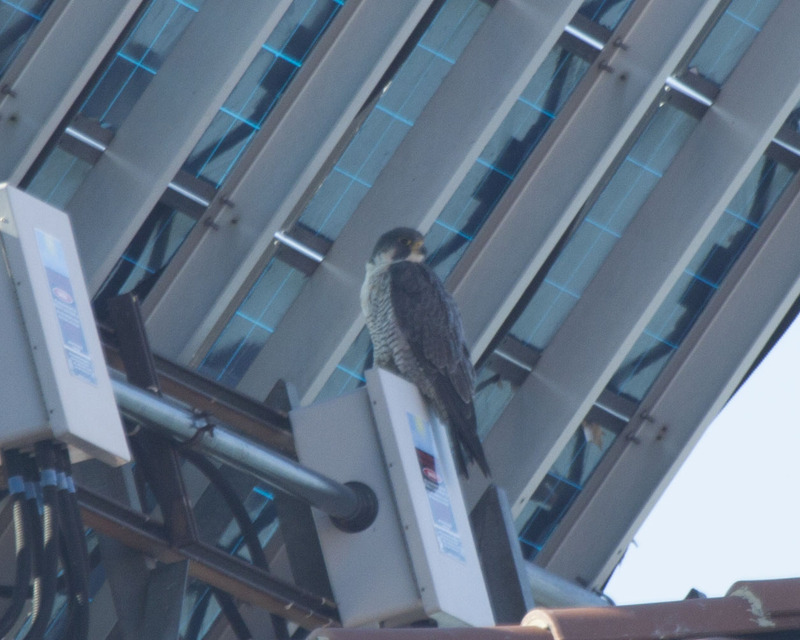 At the Crib, we saw a Peregrine Falcon perched up on the structure. This was the farthest we went out into the lake. On our way back towards shore, we scanned all of the gulls but were not able to attract anything rare with all of our chum. 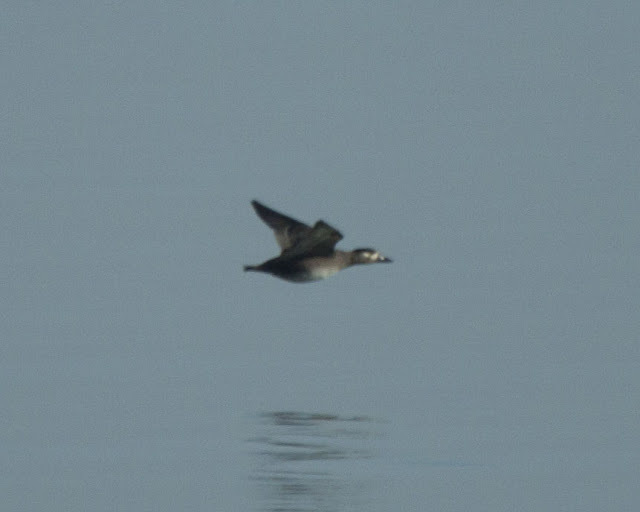 Just before we arrived back at the mouth of the river that would lead us to the harbor, someone spotted a Long-tailed Duck. This was the perfect way to cap off the trip. I got to hang out with a bunch of the awesome staff from BSBO that afternoon, and for dinner we went to one of my favorite restaurants in the Magee Marsh area, The Oregon Inn! If you think this trip sounds like fun, be sure to join us for one or both of our next trips on November 24 and December 8. You can register for the trips here. Hope to see you on one of the trips! Can you imagine so many Redheads that you can barely see the water? Don't worry, you don't have to, you just have to go to Port Aransas, Texas! A visit to the Port Aransas Birding Center is a must for any birder when on the central coast of Texas. There is a short boardwalk out into a big marsh with a 2-story tower that overlooks the water. 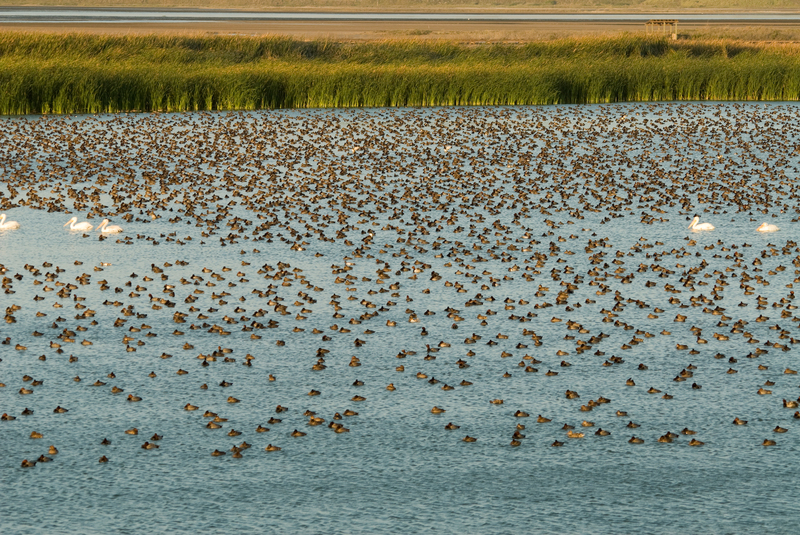 Over the last couple weeks some great birds have shown up with the huge flocks of Redheads including Surf Scoter, Long-tailed Duck, and Eurasian Wigeon. More Redheads . 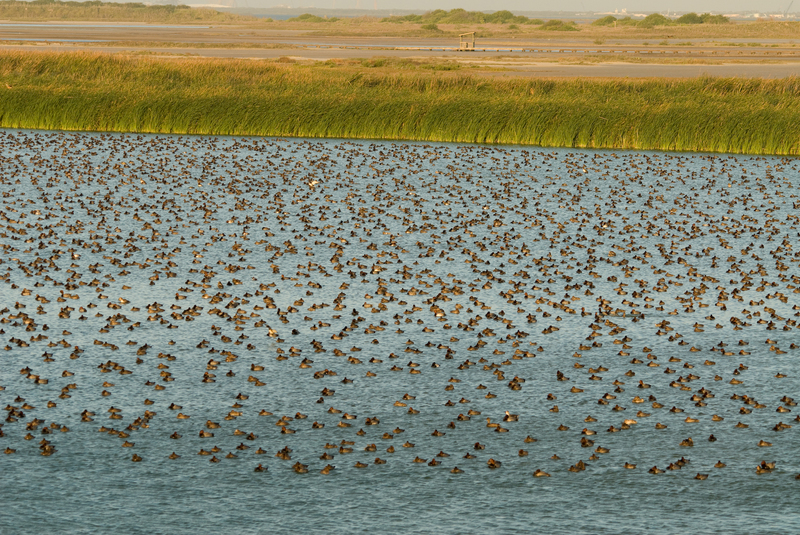 . .
Another location on Mustang Island is the Packery Channel that separates Mustang from Padre Island. 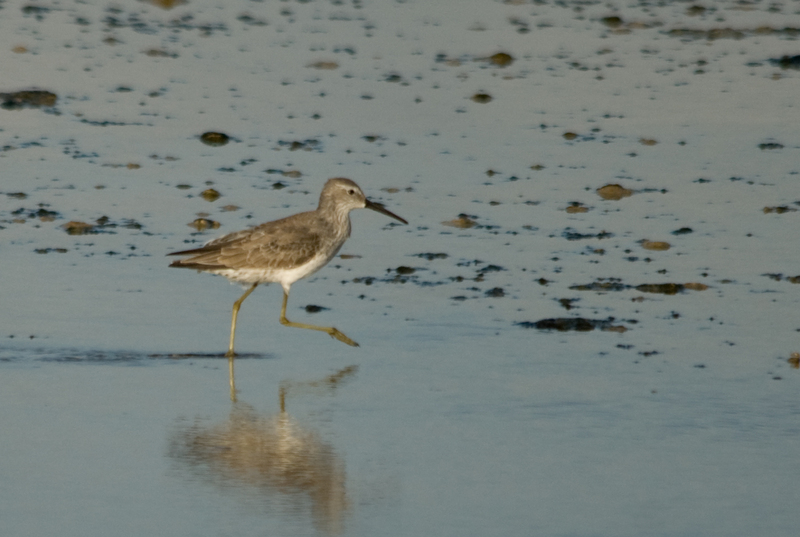 This location can be excellent for shorebirds, terns, and gulls. Some easy-to-identify shorebirds such as Whimbrel, Long-billed Curlew, and American Oystercatcher feed alongside more difficult-to-identify species such as the dowitchers and peeps. 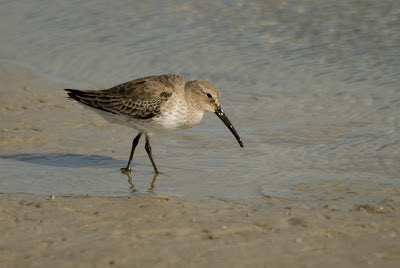 Dunlin-one of the more common shorebirds in the area. 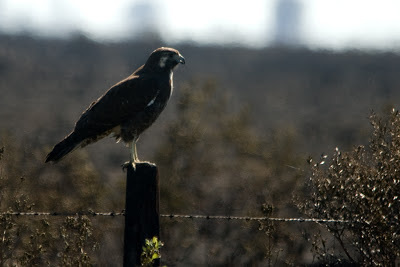 Over the past few days I have birded many places in the lower Rio Grande Valley. The weather has not been great; the first couple days were hot with strong south winds which changed to 70s with strong north winds today. 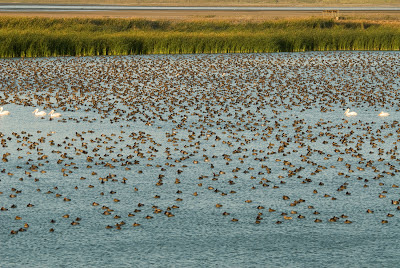 Birds have been pretty scarce with some small flocks here and there but usually nothing around. 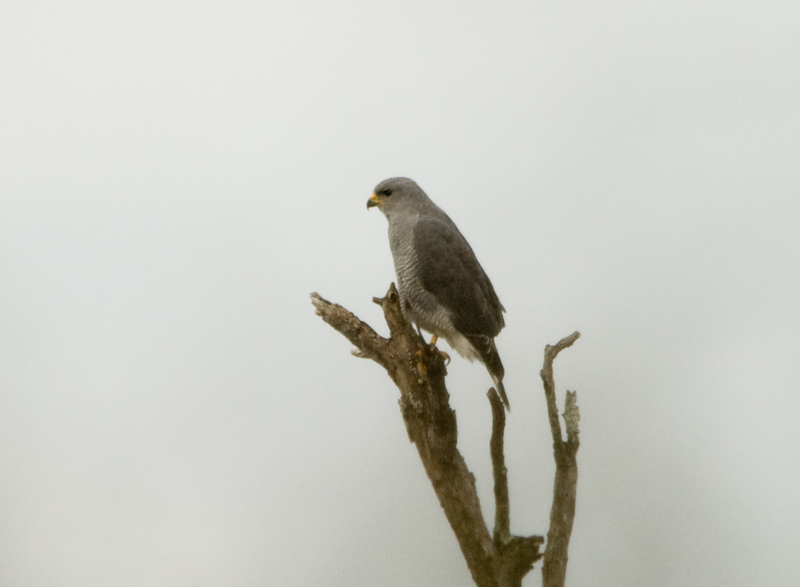 A few of the highlights have been Hook-billed Kite, Clay-colored Thrush, and Gray Hawk. Hopefully the weather changes for the better tomorrow! This week's bird quiz turned out to be trickier than I had anticipated. We had a lot of right answers and many people still have a shot at winning this series of quizzes! This quiz proved to be pretty challenging. A lot of this bird is obstructed by vegetation but there are some good field marks that we can see. 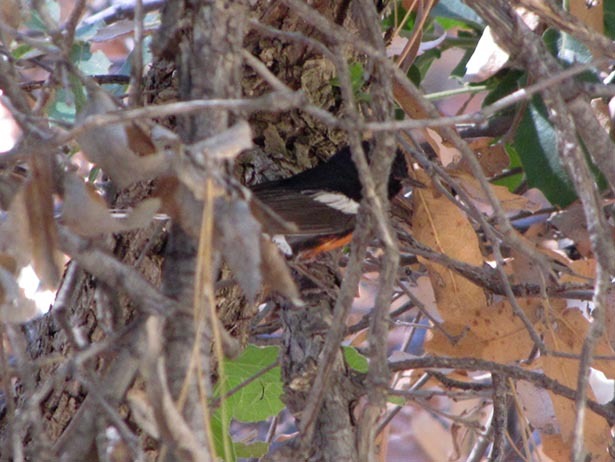 We can see that this bird has a thin short bill, a huge white wing patch, some reddish orange color on the belly, and some white on the tail. If you look really closely at the head, you can also see a very narrow lower eye-arc. The thin bill and the location and size of the wing patch should help us eliminate a lot of species including both towhees and Baltimore and Orchard Oriole. The only bird that fits the rest of this description is a Painted Redstart. While traveling down to the Rio Grande Valley a couple of days ago, I birded a variety of locations along the upper Texas coast. 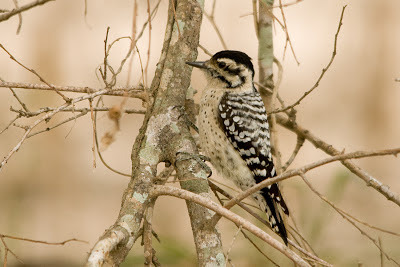 I was able to bird Anahuac NWR, Texas Point NWR, and Sea Rim State Park as well as some other spots I didn't spend as much time at. I also stopped by some of the Port Aransas spots and had more Redheads than you can imagine. 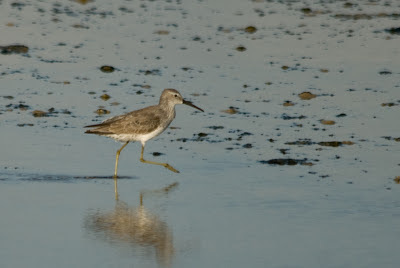 I also had many shorebirds including Long-billed Curlews, Whimbrel, Marbled Godwit, Stilt Sandpiper, and two Western Sandpipers. I will post some more detail about each of these spots later . . . hope you enjoy the photos! 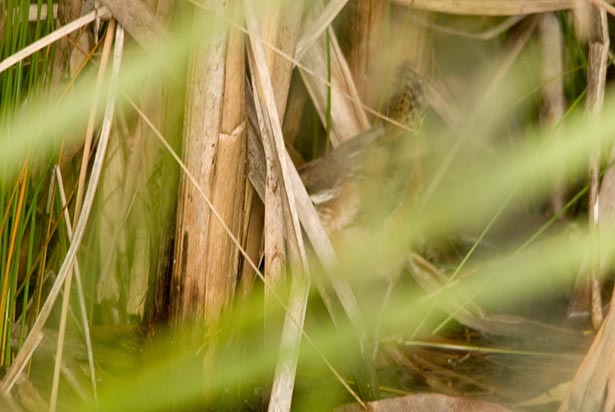 A very curious Sedge Wren at Anahuac . . .
against me on this one. Well, I didn't travel to Texas to see Northern Harriers, however, they have been great fun to watch and photograph. It is unbelievable how numerous they are along the upper Texas coast; I have seen them practically every time I scan the horizon! Photographing them is a different story; while they will give some close flybys they are difficult to follow as they are hunting. 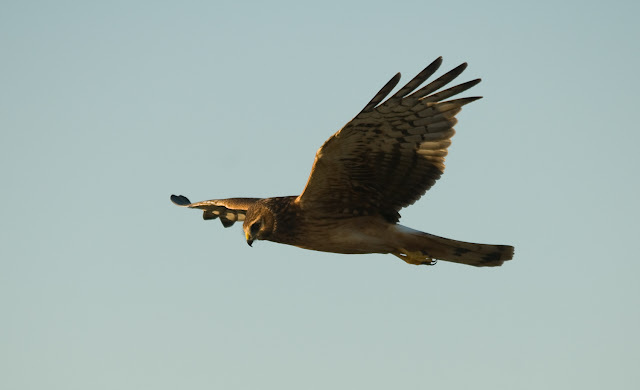 Northern Harrier-Look at that look! 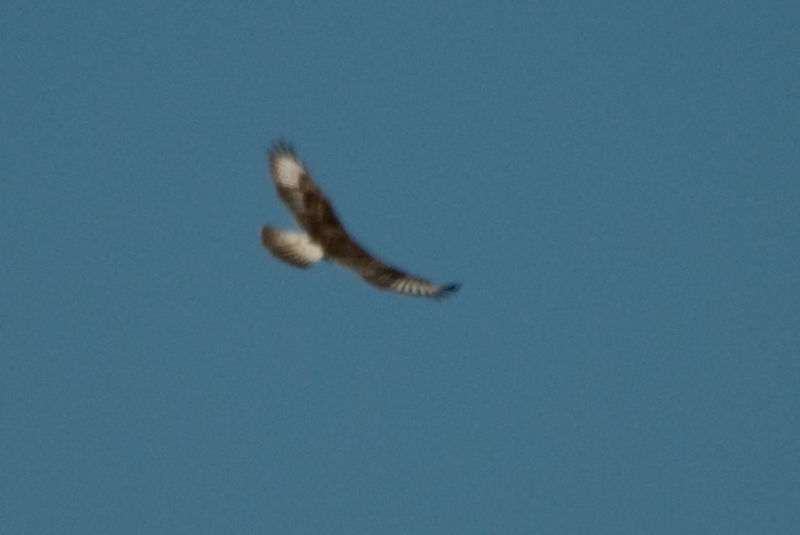 The same Northern Harrier hovering over the beach. Again, the same harrier, just a few seconds after the above shot. 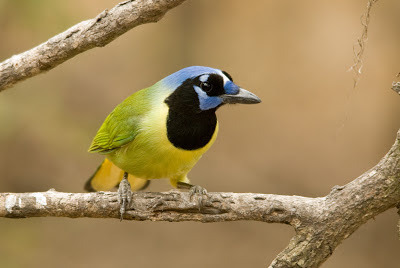 Over the next couple days I will post more about my "Texas" birds. This past weekend, my wife and I headed to Dayton for the 6th Annual Ohio Young Birders Club (OYBC) Conference! 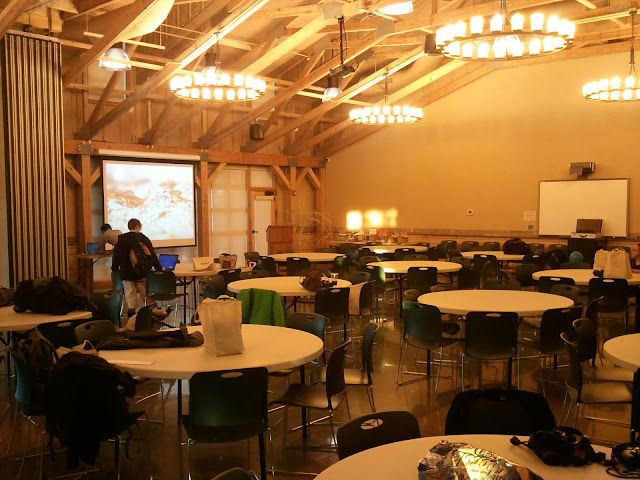 The conference was held at the brand new Aullwood Audubon Center and Farm. On Friday night, we arrived in time to meet up with the crew from BSBO for dinner and had a great time hanging out with our friends Kenn and Kim Kaufman and I got to meet Ethan Rising, a young birder from Ohio that always answers our weekly NuttyBirder.com bird quiz! The next morning, we arrived at the center early so that I could join in the bird hike and Steph could watch some of the bird banding demonstration! We had some great birds on the hike including, Winter Wren, Brown Creeper, and Red-breasted Nuthatch. 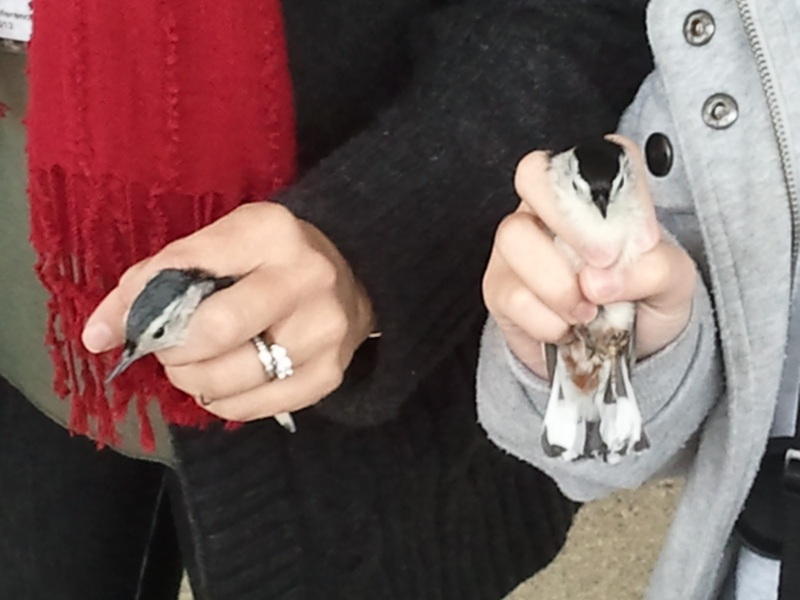 During the banding, they caught a male and female White-breasted Nuthatch at the same time and we were able to compare the darkness or their crowns. After the hikes and banding, as well as the building of Prothonotary Warbler nest boxes, the main conference got started! The presentation room before everyone arrived. From the start, this conference has had kids present all of the programs. Over the years, participants of the conference have been blown away by the quality of the presentations that the OYBC members put together and this year was no exception. While there were too many awesome presentations to talk about all of them, I will mention a few. Dakota Callaway, who blogs on BirdFreak.com, gave a great presentation on the different citizen science projects that people can get involved with and reminded us why it is important to be involved with them. It was the first time he had ever presented and he did an awesome job! Kristina Polk gave one of my favorite presentations of the whole conference when she presented on her spark bird and how that bird changed her life. I think that she left all of the young birders with some great ideas on how to pursue their passion in birds and inspired them to do great things! The keynote speaker was Benjamin Van Doren. Benjamin is only a freshman at Cornell University but he has already done some amazing research. He presented on his research on migratory birds and how they move in the morning after their overnight migrations. He placed 5th in the Intel Science Talent Search for this research and I am sure the we will see many more amazing things from him during his time at Cornell! The conference was a huge success with well over 100 people in attendance! This is really one of the most fun birding events of the year and I encourage everyone to attend this conference at least once! 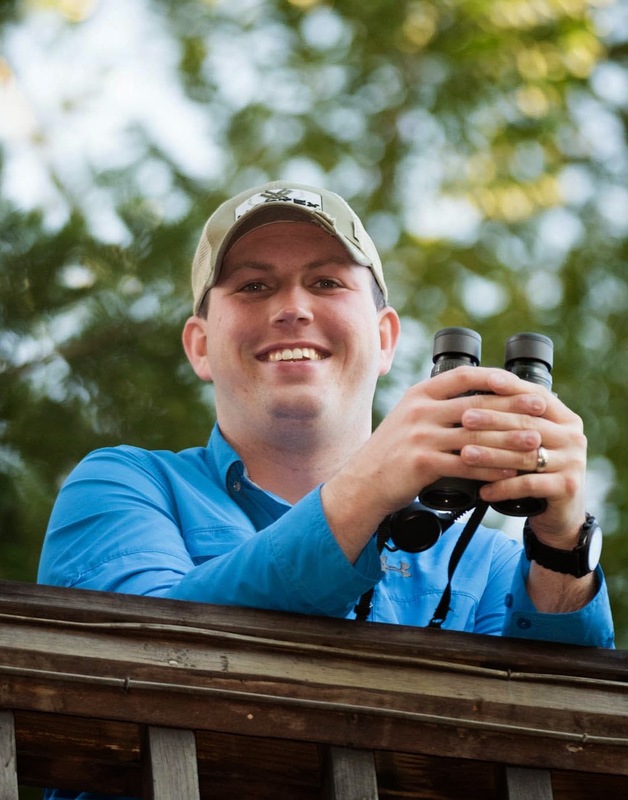 We at the Indiana Young Birders Club have become so inspired that we will be putting on the 1st annual IYBC Conference in 2013! 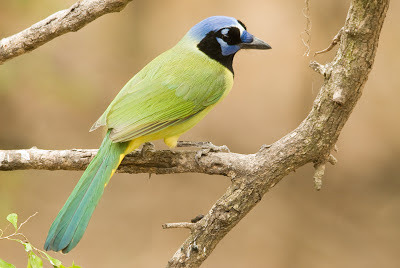 Tomorrow I'll be heading down to Texas for some birding along the Gulf coast all the way down to the Rio Grande Valley. 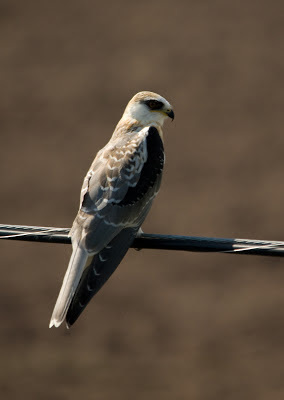 For the next couple weeks, I'll be enjoying birds from Seaside Sparrows to White-tailed Hawks to Green Jays. I'll be spending most of my time on the upper Texas coast in the Anahuac/High Island area and throughout the Rio Grande Valley. Hopefully some rare Mexican species make it across the border in the next couple weeks! 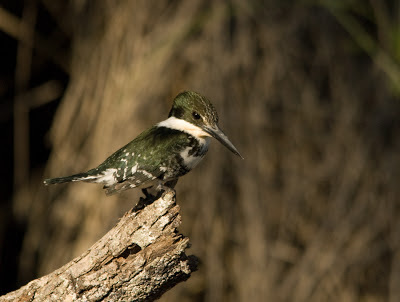 Green Kingfisher-my favorite species of kingfisher that I have seen.